Violin studies in Alfter and in Würzburg. Study of Free Music. 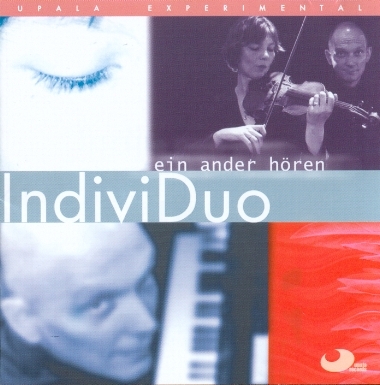 1998 foundation of the "IndiviDuo" and membership of the "Gruppe Freie Musik Dresden". Nominated for the 6. Junior Musicians' Forum of the New Music Association. Concert musician for violin and viola; teacher of Free Music. Lives in Kassel and manages the office of the "Deutsche Institut für Improvisation" in Kassel. Studies in Leipzig: composition, conducting, piano. Works as a teacher and a composer in Halle/Saale. Co-founder of the "Gruppe Freie Musik Dresden". Composers "Award Hans Stieber," Halle; Händel-Award of the city of Halle. In 1998 foundation of "IndiviDuo". Works as pianist; choir leader and teacher of improvisation. Lives in Hannover. A flow of freely created sentences involving violin and piano (occasional voices), each sentence with a spearate character. Our attention was focused on the interplay, particularly on aspects such as articulation, dynamic, timbre and structuring. Very gradual metamorphoses in one sentence for RiKoBra (read the explanation further down) and piano, also voice. The basic mood is inner peace, the feeling of an abundance of time, purposelessness. During the middle part the principle of using only minimal changes is expressed at its strongest. Another flow of free, characteristic sentences for piano and violin, as well as voices, this time with a focus on the various qualities of rhythm and movement. The violinist seated in the audience, the pianist on stage, each of them playing independently, as a soloist. this coinciding of apparently unrelated, but acutally very subtly related co-creations we call "constellative playing." Bits of improvisationally treated elements of language are alternated with instrumental parts, characterized by an emphasis on "inner listening" and concentration on the essential. Free playing with grand piano and RiKoBra, one sentence, with special attention to the nuances on the essential. Based on the principle of continuously varying movement, on our viola and the piano we cross all sorts of musical "waters", from time to time resting on "islands of voice." This voyage is the theme of one uninterrupted sentence. Free music is improvisation. When playing, we neither rely on sheets of music nor on our memories, but draw inspiration from silence, from listening, from the present situation, but also tapping our musical experience and our joy in artistic liveliness. We are interpreters and composers at the same time, we're even our own teachers, by lining out these tasks for ourselves. But these tasks are not concerned with previously fixed forms, as is often the case when improvising, - where the musician picks up on a pre-determined theme and enlarges it, such as a cycle of variations or even a fugue. Our aim is to concentrate on very specific aspects of the musical endeavor. We concentrate on the sound, the interplay of sounds, the coming together of rhythms and structures. These variegated, rich, musical worlds influence and determine each other. The attention to the nuances, to the question as to how the details are intertwined and thereby produce meaning, in the end create the whole performance. We do not achieve this by purposefully driving at a predetermined result, but by practising our awareness to discern themes moving in time. This process is not an arbitrary one -, but is governed by spontaneous decisions at particular moments. The deeper I immerse myself in a particular context, such as the complexities of the tonal system, the more alert I can be. The playful, yet rigorous examination of the challenge at hand does not exclude spontaneity and a certain lust for coincidental turns. The openness for unexpected developments, for surprising confluences, widens the perceptions of the inner ear; the discovery of new instrumental ways of playing can be very inspiring if music is met with a questioning attitude. On the other hand, whenever I'm sure I've already done it all and heard it all, I run the risk of stagnating with my old habits and narrowness. So we try to meet all challenges with exactitude paired with artistic presence, open and wide inside, and to play with the utmost attention, true to ourselves and existentially connected with whatever it is we do, so that the music we play expresses - us. What is decisive for this process, apart from the question of what we play, is the question of how we play. The way music comes alive may simply not be described in words; if I speak of a low and short sound, this does not express anything of this Low and Short. These qualities are so transient, impossible to repeat and dependent on the context of whatever is going on; they encompass such filigree relationships and mixtures of sound, articulation, of rhythm, they can only unfold through the sensitive, self-responsible work of the musician. So even when executing a composition the musician still has a large degree of freedom to improvise. But as we play without preconceived scheme, that is to say totally free and responsible only to ourselves, this freedom to draw from the immeasurable source of qualities takes on a extreme importance. For the artistic experience, the What and the How may no longer be separated: this is the reason why we chose free improvisation. Often totally new ways of expression arise, as not only the instruments but also the voices are used in highly original ways. Sometimes language drifts into the music. Rike Kohlhepp sometimes uses an unusually strung viola, with a increased tonal scope on the lower range: the RiKoBra. Frequently sounds are altered by mutually influencing their vibration, so that the tonal system is increased by "variable tonal pitches". - However, we do limit ourselves to purely acoustical means; live-electronics or any other such enhancements are not used. In order to create a programme for a concert we agree on a suite of basic improvisation tasks, the realisation of which is meant to differ - and it does! - from concert to concert. These tasks develop naturally during our rehearsals, which we comprehend as an ongoing "artistic research project".